Martin Guitar Serial Numbers | When was my Martin Guitar built? First locate the Serial number on your Martin® guitar. (The Model number is not necessary to find the date of manufacture.) Serial numbers are found on the neck block. Looking inside the soundhole and toward the neck you will find the serial number and model stamped on the neck block. The model number is above, the serial number is below it. The serial numbers denote the last serial number used in that year. Example: Serial Number 439628 was built in 1983 as the last serial number made in 1982 was 439627. 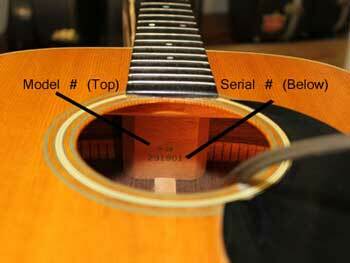 Serial numbers listed do not apply to Martin Backpackers® or Little Martin® guitars. Contact the factory for production dates on those instruments. * Serial numbers 900,001 to 902,908 were used on Sigma-Martins in 1981 and 1982.